"The key is to cut down on the greasy ribs and switch to lean cuts, which have a higher protein-to-fat ratio. 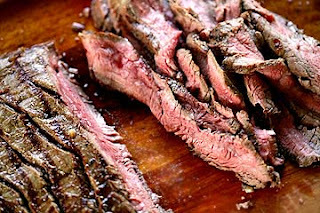 Try flank steak. With only 176 calories per 4-ounce serving, flank is one of the leanest cuts at the meat counter, and it offers an impressive 24 grams of protein. " To read the FULL article: Page 1, Page 2, Page 3.